So, it has almost been an entire year since I last posted here. However, there are moments that take you completely by surprise and you just have to voice your feelings over those moments. I felt compelled to write today. I lost Asher at the pool this morning. Only for about 10sec… but I had just taken off his floaties and then when I turned around I realized I did not see him anywhere. I started screaming like a crazy person, completely scaring everyone within a 10 mile radius. I actually scanned the bottom of the pool because in my mind, death is always only a second away. In that moment, he was gone. Of course he would be taken from me, just like his brother. From the moment Asher was born that is how my mind has worked. There is always an element of fear and anxiety. Most days I do not give in to the temptation to allow the worry and anxiety to rule over my life, but in reality the temptation is always there. It is real. Everything is scary to me. I realize in these moments of sheer terror that God still has a lot of work to do in me… That when I say I trust Him, I may not in fact truly trust Him. I feel like the father in Mark 9:24 when he cries out to Jesus saying, “I believe; help my unbelief!” I have just enough faith to know that I need to cry out to God asking for more…. I thank God that Asher did not drown in the pool today. I thank God that instead of me finding him in the pool without his floaties on he was hiding behind a column. I thank God that I was reminded once again that these wonderful children are not my own, that they are gift that God has entrusted to me. 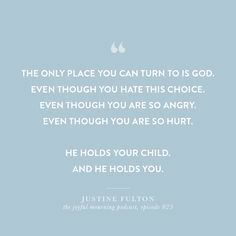 I am thankful that God is continually molding me and shaping me into the woman He has called me to be… even through frightening circumstances. Three years is a long time… It has almost been 3 years since I last saw my son and I miss him more today than ever. The terrible sick feeling in the pit of my stomach that didn’t leave for months after Aaden died, is there again at the mere thought that I could have lost Asher. For all of those people in your lives that have suffered, pray for them. Though it may have been years since the initial suffering… I promise you that their hearts still ache and that the pain is still very real.